The holiday season (and the heating season) is fast approaching here in North America! If you’re thinking of giving your home – or someone you really like – the gift of a WiFi-enabled smart thermostat, then you should check out our handy buyers guide below! We’ll compare all the most popular thermostats and make recommendations based on features, price points, and tie-ins with up and coming “Internet of Things” ecosystems. Note: this guide is written for shoppers in the United States and Canada. If you live outside of North America, your options will differ from those shown in this guide! 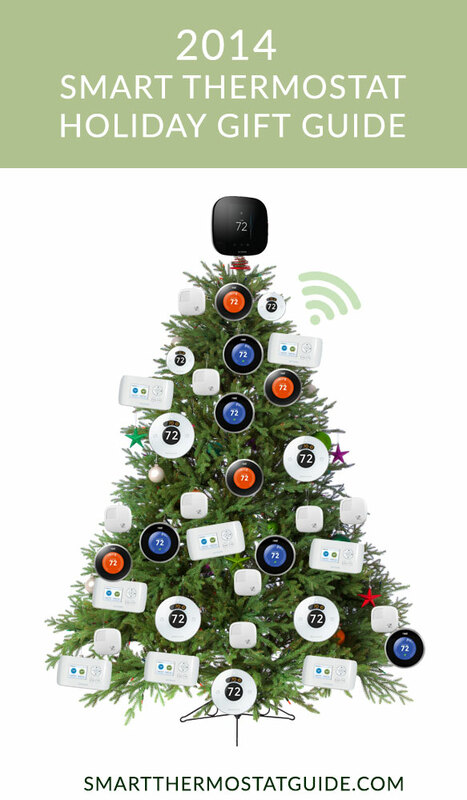 Meet the major thermostats of the 2014 holiday shopping season: ecobee3, Lyric, Nest, plus a few other contenders we think are worthy of your consideration. Claim to fame: Little sensors to place around your home ensure that the rooms you care about most get heated or cooled to the temperature you desire. Also: iron-clad control over virtually every HVAC feature you can imagine. We like: Almost everything, really – there are data reports for us energy efficiency nerds, settings for virtually every HVAC feature, and even the physical hardware is eye-pleasing and features a large (3″ tall) touch screen. The sensors are clever and a good idea for homes where the builder put the thermostat somewhere stupid, like next to the door that opens to the winter freeze or in direct sunlight. We don’t like: Just beware that the sensors don’t actually make your HVAC system redirect heat or cool air. If you want that far room that’s always cold to be warmer, you may find other rooms get too hot in the process. (And at that point, you might be better off with a space heater or an oscillating fan). 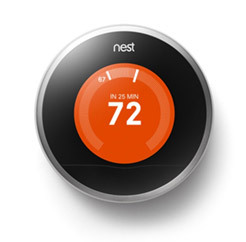 Nest still has the name recognition, but other thermostat makers are pulling ahead on features. We don’t like: The twist dial is cute, but we’re bigger fans of the touch screens in use by ecobee and the Honeywell Lyric. We think the 3-degree temperature swing range is too large – the Nest waits until your home’s temperature drops a full 3 degrees below the temperature you’ve chosen before firing up the heat. Yes, this saves energy, but it makes for a rather variable home temp that many homeowners don’t appreciate. Also note that the Nest is a “learning” thermostat, so you’ll go through a 1-2 week adjustment period as you manually “correct” Nest and “train” it into meeting your heating/cooling needs. Also, while we don’t want to go too far down the Google-paranoia rabbit hole, we think Google already has a lot of eyeballs into our computer and Internet usage and the thought of adding yet another window for Google to peer into our home makes us (and a lot of other people) a little uneasy. If you aren’t a fan of Google’s data collection, you might want to feed your data to some other company instead. It might be the lowest-cost thermostat in this list, but it offers loads of features, including usage reports, companion apps, and easy scheduling. Claim to fame: Low price with loads of features. All that’s missing is a touch screen, really, and a lot of people find they can live without one. We like: ecobee’s free Home IQ reports show your energy usage for the month. Full featured companion app, nuanced control over HVAC settings. If you have multiple thermostats in your house to replace, you can probably buy two Smart Si units for the cost of one Nest or ecobee3. Plus, it’s hard to ignore all those great Amazon.com reviews. We don’t like: It’s hard to dislike anything about this thermostat. Its physical design is a bit dated, but it’s no uglier than any of the bland programmable thermostats from the 1980’s and 90’s. We ranked it below the Nest because while the Smart Si is an excellent choice for your home, it is less likely to “wow” gift recipients the way a stylish ecobee3 or Nest would (gift-giving is weird like that). If you’re shopping for yourself, though, this is a tough thermostat to beat. Honeywell Lyric wall unit casts a blue or orange glow onto the wall behind it, depending on what mode its in. Claim to fame: “Geofencing” feature figures out if you’re inside the fence (home) or outside it (away) and responds accordingly. 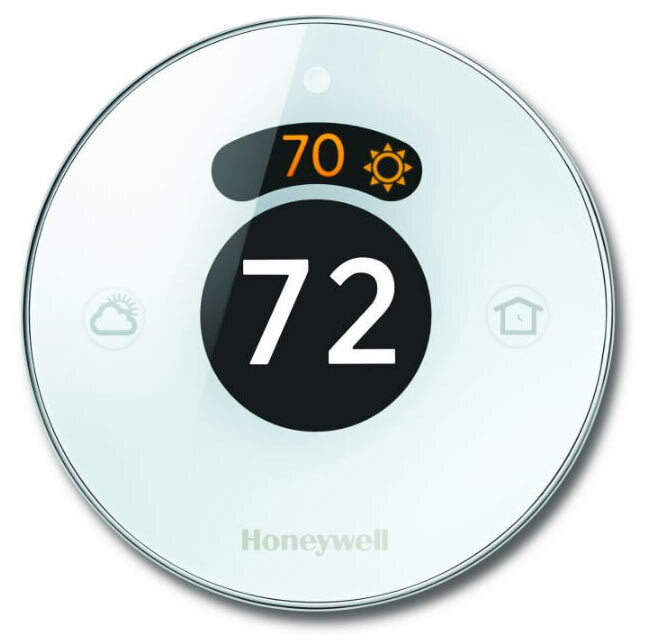 We like: The Lyric has an attractive design, and we like Honeywell’s long legacy of strength in the thermostat marketplace. Also, HomeKit integration is coming… soon. We don’t like: A rocky August launch flooded review sites with complaints, but thanks to app and firmware updates things are looking better now. Still, it’s disheartening to wade through so many disappointed reviews on this promising thermostat. We think the geofencing is fraught with questions about its reliability (what if you work and run all your errands within 7 miles of home?) and for systems without a C-wire, the Lyric requires a AA lithium batteries (swapping batteries is so 1987). We think the ecobee3 and Nest both offer more and better features than the Lyric, but if you’re really sold on the geofencing feature and don’t like the idea of going through Nest’s “learning” period, then the Lyric might be for you. 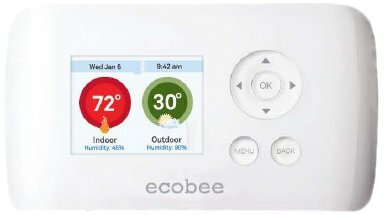 We’re big fans of Amazon.com for its easy returns, fast shipping, and review community, but shop around – these thermostats are going to be super popular this year! You might find good deals at your local retailers, especially on or around Black Friday (the Friday and weekend following Thanksgiving). The holiday season (and the heating season) is fast approaching here in North America! If you're thinking of giving your home - or someone you really like - the gift of a WiFi-enabled smart thermostat, then you should check out our handy buyers guide. I purchased an ecobee3 for my new home. It is regulating a 5 ton heatpump. The ecobee customer service is second to none. I’m also a contractor. I have installed nest, honeywell and others. All good products but ecobee had endless possibilities.